There is something natural about a wedding on New Year’s Eve. The separate occasions have a lot in common already: celebration of a new beginning, champagne toasts, kissing and even fireworks! Plus everyone gets to show off their sparkly outfits! 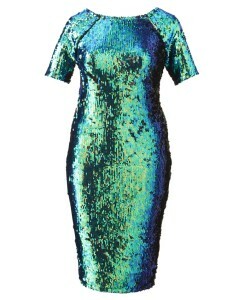 With that in mind, here’s an ALL SEQUIN (yep) way to look fabulous and festive. And finally, the shoes. I actually suggest pulling back on this one, given the dress and the clutch. I think it would be unexpected and chic to have just a hint on the shoes (in the back! 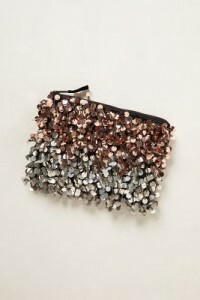 ), using sequin shoe clips. The added bonus is that you can use a pair of shoes you already own! 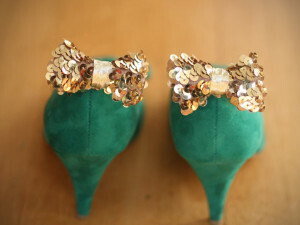 Shoe clips can be purchased all over Etsy, or follow the link below to an easy DIY.